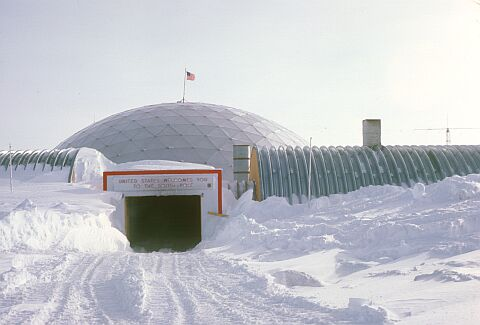 A large colony lives in the Antarctic in a network of bases. They have so far evaded the dreadful worldwide plague. When they venture outside their base they don their climate-proof clothing and their goggles. These goggles have liquid lenses. The colonists use beer as one of the immiscible liquids in their goggles. Why is this? Beer has a slightly lower freezing point than water, and is less corrosive to the electrical contacts than salt water with the same freezing point. Even better, beer can be made dark as part of the regular process (simply by roasting some of the malt longer/hotter). Therefore, the same liquid can be used in its varifocal role, as a filter against excessive sunlight (and changed out for a lighter brew in winter/night), and won't freeze at the lower temperature setting needed for some of the local conditions. Ordinary beer freezes at a couple degrees below 0 C; wine a little lower. However, beer can be made as strong as wine and give a freezing point around -5 C -- or you can partially freeze the beer ("jacking", from apple jack, made by freezing cider) and pour off the liquid and obtain a liquor as strong as 50%, or even higher. 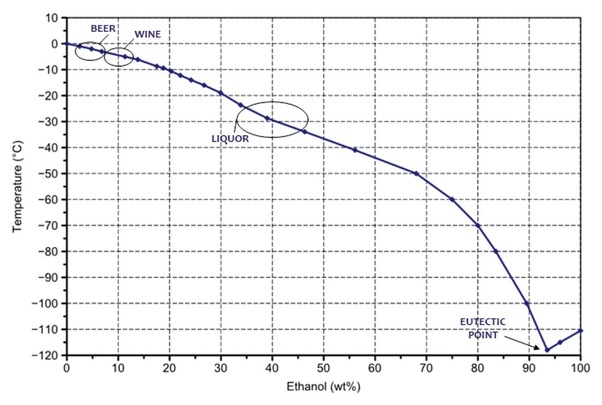 By report it's horrible stuff to drink, but the freezing point of 50% alcohol in water is close to -40 C; by this method you can lower the freezing point down to whatever temperature your refrigeration (or weather) is good for (even Antarctica isn't likely to give you 95% alcohol, which freezes at about -118 C). Not the answer you're looking for? Browse other questions tagged hard-science colonization optics or ask your own question. What are the minimum local environment requirements for a human colony? How many people would it take to repopulate the Earth? How large would the population get before degradation? Is it (practically) possible to determine the stellar coordinates of a planet from a photograph of the night sky? How big can the Parachute cities be? How long would it take for a humanoid race at the technical level of the 1500s to gain control of an entire Earth-sized planet? How big a population can the solar system support considering only power and living space? What are the priorities to colonize a new piece of land? What if Great Britain never took over the Dutch Cape Colony in 1806?